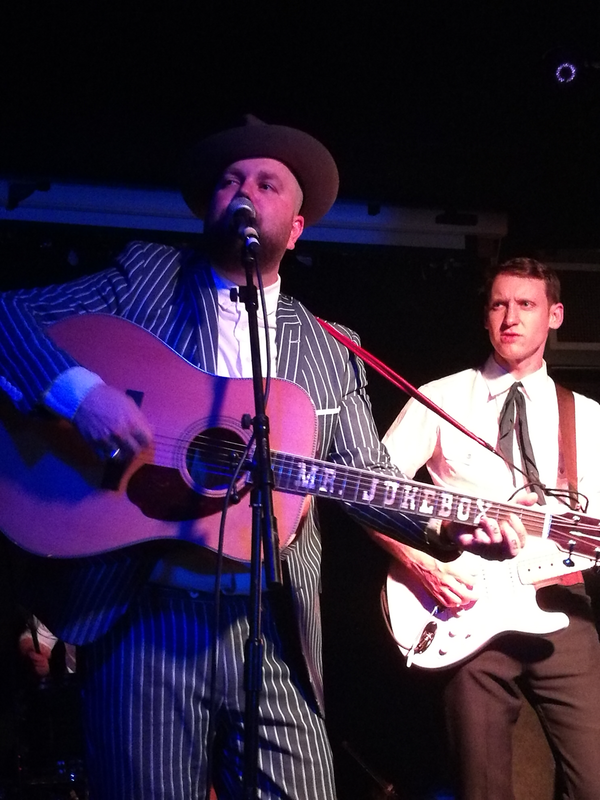 With a slot on the bill at this weekend's Long Road Festival, Joshua Hedley made the first stop of his UK tour at the intimate Old Blue Last in London's Shoreditch. As with many intimate venues in the city it has its quirks that will live long in the memory. With the giant sign wrapping the roof of the corner bar, inside, you could be at any bar in the city. Once the live area doors open, it is only then that you find out how intimate and quirky this venue is. Instead of heading into a basement room, you're going up into the loft to be greater with a small floor and stage tucked in behind the door. As the sell out crowd began to make their way in, UK artist Twinnie took the stage as Joshua's support act. With Hedleys known for his suited and booted attire on stage, Twinnie went all out with her outfit to make sure she looked the part - even if it made it hard to bend down to get a drink. With an album in progress she shared songs from it as well as from her upcoming single which is due for release in October. As with all country concerts, the crowd listened and took in every word - even if her grandmother had forgotten to put her phone on silent!! A little after 9:30 Joshua Hedley and The Headliners took to the stage. At this point many people (including Hedleys) noticed one slight issue with the venue - it was hot! Unfazed by the temperature and lack of fans on stage, Hedley let The Headliners do the instrumental work as he got on with singing Night Life before picking up the guitar for his latest single, Weird Thought Thinker, and Counting All My Tears. It took just 3 songs for Hedley to need to remove his hat due to the heart the room! Again,not deterred, he continued with the set. Introducing one of my favourite tracks from his Mr Jukebox album, These Walls, he told the crowd how it was about a bar which thankfully had now been torn down. Hedley continued his set with Don't Waste Your Tears and What A Way To Live before all on stage went for a much needed, and well deserved, breather. At this point Hedley invited on stage another UK artist, Ags Connolly, to play a short set. Hedley returned to stage questioning the lack of air conditioning in the UK! As staff moved fans onto the stage, Hedley was ready to go again. He started off with This Time before covering David Houston's track Living In A House Full Of Love. With the set coming to a close, Hedley still had time for three more tracks Never Shed A Tear, the well named Let's Take A Vacation - which Hedley explained how he's a songwriter and doesn't always need to be creative - before closing the set, as he put it, with the only song we haven't played yet. Mr. Jukebox. While Ags was on stage he commented how it was a privilege to get to see Hedley in such an intimate setting and that is so true. It is still a wonder how a singer songwriter with so much raw talent is still such an unheard and under recognised artist in country music. With the Mr. Jukebox album bringing the fiddler to the attention of fans, based on this performance, it won't take long till he gets the recognition he so thoroughly deserves and there is no doubt he will be playing (and selling out) much larger venues on his next visit. There is still plenty of opportunities for fans to see Hedley perform during his current tour with stops in Bristol, Glasgow and Gateshead before performing at the inaugural Long Road Festival on Sunday. For the last couple of months, Joshua Hedley has been making headlines for his debut album - ‘Mr Jukebox’ - an album that many deem to be an awakening to Country Music today. Born and raised in Florida to the sounds of countless country songs, where at the age 9, influenced Hedley to pick up the fiddle. An instrument that would later take him on unforgettable ride. With the release of ‘Mr Jukebox’ we caught up with Hedley to talk about his album, suit plus many more. 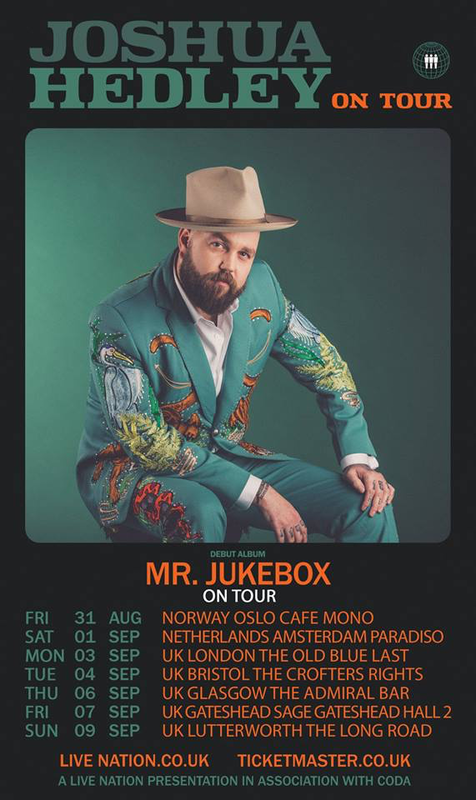 Joshua Hedley is set to make his first appearance in the UK with a string of shows around the country the next coming month- see link to find out more. RT: Hi Josh, How are you today? JH: I am pretty good, just relaxing. RT: You’ve had a lot going on recently you just flew back to Australia and now about to visit the UK soon too! Very busy..
JH: Yeah, I’m staying busy for sure but it beats the alternative so I’m not complaining. RT: First off congratulation on the recent hit release Mr Jukebox, but before we go anywhere we have to talk about your surprise appearance in Oregon alongside Willie Nelson and Alison Krauss! How did that come about? JH: That was crazy. That is my bass player, Misa Arriaga is friends with Willie and we had just landed from Australia in Portland that day and we actually we went to the legal marijuana distributor and we are hanging out there and started talking about how Willie has his own weed called Willie’s reserve and I was asking if they had any in and they said no but they said “Willie is here tonight” so I was like ‘oh really’ and I looked back and Miso was already on the phone to Willie’s wife. We got tickets, he was texting Willie’s wife and she said ‘why don’t you get up and sing with them on Gospel Medley, you and Josh get up there and sing’ so we did, that was insane! When I got on the plane in Brisbane, Australia I didn’t know that day was going to end on stage with Willie Nelson and Alison Krauss! Pretty wild. RT: Aside from Oregon and Australia. I must ask about your Opry debut and the panther suit! Who was it made by? JH: The suit was made by a guy named Jerry Atwood, he’s got a company called ‘Union Western’ also Texas Joe’s Barbecue in London, he’s also part of union western clothing and they got me outfited. I told them I wanted a Florida themed suit and he did it perfect and yeah I decided if I was going to make my Ryman debut or my Opry debut then I needed to wear the rhinestone for it. It was pretty cool, the whole Opry debut was sort of a its a little blurry because it was just overwhelming but all I could talk about is the second time, because I feel like that you know they say you never forget your first Opry debut and its true, it was really cool but it’s one of those things were its like ‘that was great’ and that was a dream come true and I may never get to do it again. And it's when they call you the second time and want you to come back! For me that was more special thing. I was like ‘ok, they like me and they want me to play there’ I got to do it 4 times now and every time is incredible. RT: For your first performance, was it everything as you expected it to be? JH: I had no idea what to expect. I had played once before with Justin Townes Earle as a fiddle player but that was just so fast- in and out- this was there was so much preparation leading up to it by the time the actual two song thing happened it was just like on stage off stage. I was sort of like woo! I hope I did a good job. Looking back at the video, it went pretty well andIi can’t believe it happened because its a thing i planned for. RT: Now I know you’ve been touring extensively promoting your album- are you excited to come back as a solo artist and main headliner to the UK? JH: I came earlier this year in May just to do press and stuff but we were just in London, I didn’t get off the area and didn’t see more of the UK. So, I’m excited to do a full thing and to go out there and see most of Europe, Scandinavia and more of the UK this time. RT: Let’s talk a little bit about your recent release Mr Jukebox, an album which is prephas considered in a way revolutionary for retaining authentic country sound- were you expecting such huge receive from audience upon releasing your single? JH: No, I didn’t really know what to expect. I kinda went into some territory that people have been staying away from a long time with that 60’s sounds, countrypolitan Nashville sound and it wasn’t really well received when it came out by country puris,t they didn’t care for that, all the strings and vocal harmonies and stuff. So, when I put mine out 40/50 years later I wasn’t sure what was going to happen but it seems to be going pretty well and people are pretty receptive to it. So I like that. RT: I understand that all songs were original material written by yourself with exception to ‘Let Them Talk’ and ‘Lets Take a Vacation’ that were co-written. But I can’t help but notice the cover you’ve did ‘When You Wish Upon a Star’ a disney classic! Why did you choose such song on your debut album? JH: I wanted to include a cover on the record and I want to put a cover on all my records, just because, i think it’s fun to learn them and stuff. I couldn’t really figure out what I wanted to do. I grew up in Florida and I spent a lot time with family in Disney World, we use to go there around christmas time every year. It was like one of my dad’s favourite thing and my dad passed 4 years ago and he never got to see any of this stuff that kinda happened for me so I figured that I’d put a Disney song on there to just kind of as a tribute to him and it ended up being one of the more popular song on the record. I’m excited about that, I’m happy it worked out that way. RT: Before heading to the studio what was the one aim you had in mind desired (wanted) to achieve? JH: I don’t know, we just went in there and cut. Like, We didn’t do like a whole pre-production for it. I kinda explained my vision a little bit to Jordan and Skyler and they put it together perfectly and it’s exactly what I envisioned when we went in there. I had sort of a goal, I never wrote a song then recorded it then saw it take place, take shape from beginning to end but I always had these ideas of what I wanted them to sound like. I had a hard time sort of articulating that so Jordan and Skyler really helped me in that regard and then we got to make the record and it came out perfectly the way I want to and It’s really all them. RT: Now, if you were to choose a word that’ll represent your abum what might it be? RT: Simple, I like that! RT: Before we move over, Third Man Records is a renowned independent record label that is hailed for its musical services- and you happened to be the second country artists to be signed to the label! So, how does it feel and how it happened? JH: It’s pretty cool! I kinda count Lillie Mae in there just because I’ve known her for so long but certainly she’s not putting out like country, country music per say but I’ve known her forever so, I’ve seen her play all kinds of George Jones songs so she’s a country singer in my book. but it’s cool being part of a small label there’s me, Lillie Mae, Jack, Margo, Greg Brown and SHIRT those are the only people that are signed to Third Man Records. It’s a unique situation, because you go to Warner Brothers or something they have hundreds of people signed to that label but there’s only like only 6 or 7 on Third Man, so you really get taken care off, all my needs are met pretty fast. It’s nice to be part of a small label where they can really get in and help you. RT: I heard you have 2 goals, 1 of which is to record with a full symphony. This leads me to to ask are you in way bringing Nashville’s 1960 Chet Atkins, Faron Young era back? JH: I don’t know what I’m trying to do, I guess ultimately I’m just trying to make records that I would want to listen to if it wasn’t me singing them. I just love so many different variation of country music and right now I’m just pretty stuck in that 60’s sound, I mean maybe down the road I’d like to do some crazy Ronnie Milsap 80’s synthesizer country, I don’t know..
RT: When asked in your Rolling Stones interview about being an outlaw you didn’t seem to be convinced.. With your your performances in Lower broadway for countless of years by performing country classic and keeping the sound alive and thriving in a none stop evolving city- so would you know consider yourself an ‘outlaw’ in 21st century Nashville today? In sense of brining or in a way reinforcing Nashville to remember its musical past than its Market mass produced product? JH: I guess yeah! I never really thought about it because I don’t think of myself as an outlaw in a sense in thats become today, like I don’t drink, I don’t do drugs, I don’t wear Denim vests and I don’t have any hair let along long hair but I guess in a sense that i’m kinda of breaking out of that mold of current Nashville I guess you can link it to that. I don’t know I’m just trying to make country music and that’s the way it comes out. If it’s breaking any barriers than I’m an outlaw. I think, the definition of country music is -it should be up to who buys the records and i think Florida and Georgia Line and Jason Aldean and people like that people who are buying these records are country people, It’s rural America it’s people shopping in Walmart it’s the same people that were buying Hank Williams records in the 40’s and 50’s, it’s the same people who are buying Florida and Georgia Line records today. So I don’t think it’s up to me to really decide what is and what isn’t country music but I’ll say this when you listen to my record there’s no other way to describe it I think than Country and Western music and I think if there’s room for me there’s room for Jason Aldean, there’s room for Luke Bryan there’s room for everybody to be out there and do their thing. I can’t really hate on any of those guys because they are just trying to feed their families like everybody else. But I will say this I think there’s been a lack of artistry in country music for a long time and I think people are starting to realize it and starting to want more. And that’s where people like myself and Margo Price, Jason Isbell, Sturgill Simpson people like that, I think that’s where our popularity growing and becoming a thing is people are looking for artistry in music. RT: You’ve been a sideman for many musicians including touring with the likes of Justin Townes Earle and friend Jonny Fritz- would you think there were lessons that you’ve be taught by these people as a solo artist today perhaps in terms of being a songwriter? JH: Absolutely, yeah I learned alot from touring with both of them, Justin sort of taught me the formula and how to write and just like little bits and tricks like one thing he use to say. He said if you’re describing a woman in song and you say ‘her lips are red’ you don’t have to tell people that her eyes are blue and her hair is blonde. It’s about simplicity because if you tell somebody ‘her lips were red’ maybe that guy’s girlfriend that he just lost use to wear red lipstick or maybe she had green eyes or maybe she had brown eyes, brown hair you know.. And Jonny sort of taught me how to see other sides of things, Jonny draws inspiration from the mundane and from the everyday parts of life and he sort taught me how to look at things differently. So, I definitely did learnt a lot from both of them as far as writing goes. The two of them really exposed to alot of music I wasn’t aware off like Guy Clark and then Jonny was digging into Mickey Newberry, they exposed to sort of that side of country music that I didn’t really listen much of before, sort of like you said the Texas Poets’ kinda deal. So yeah they broadened my horizon both of them. RT: finally, If there is one artists/band you’d want to work with in the future who might that be? JH: It’s hard, they’re all dead! JH: Actually my bass player and I were just talking about deut albums. They use to do duet album man, man duets like George and Paycheck they did a record together, Waylon and Willie, Merle and George. I’d love to do something like that with somebody because it’s not a thing that happens anymore. I’d love to do a duet album with Margo or Nikki Lane or something just to have that. Nobody has that Waylon and Willie thing, nobody has that Conway and Loretta thing anymore. There are no duet partners, there’s duo’s, very rarely you get two artists coming together to make a record and I would love to do that. RT: Right, Thank you Josh for your time! The classic country sound has seen a resurgence in recent years and we may be about to add the name Joshua Hedley to the list of artists at the forefront of this wave (who is signed to Third Man Records - the same label as Margo Price). The Florida native may have packed his bags like many musician and made the move to Music City at the age of 19 in the role of a fiddle player, however at the age of 28 he began writing his own songs. Of his debut album Hedley has said he wants the listeners to “remember they have feelings, and that they’re valid.” For fans of Merle Haggard and some old school country singing this album will certainly get your full attention. I’ll warn you now though, if you’re listening carefully to the lyrics you may need a box of tissues close by! As the intro to Counting All My Tears kicks in you are instantly thrown back in town to a time before the country music genre was hard to define what was and what isn’t country with a sombre tale of a lonely person reminiscing over better times. The title track, Mr Jukebox, picks up the tempo from a unique point of view - the jukebox. It’s always there in the corner and is ready to provide the perfect song for a first dance or the pick me up song when you’re feeling low at any time. Earlier we had the point of view of a jukebox and now Hedley asks what sad song the walls would sing and questions the things they must have heard and seen over the years in These Walls if they were able to sing, hear and talk. Put the tissues away, Hedley has a happy upbeat tale for with Let Them Talk. Locals find out about a new relationship and all want to know the gossip and what’s going on behind closed doors as soon as possible. A very familiar song from everyone’s childhood brings the album to a close. When You Wish Upon A Star needs no introduction and is a fitting end to album which tells so many tales of the ups and downs of relationships and experiences that most people would have experienced in their life. Hedley has shown with his debut album that despite the wave of pop and rock infused country music we are now becoming accustomed to seeing released there is still room for the old-school traditional sound that will never go out of style and he has demonstrated he is only going to do it one way - his way. For many this album will be welcomed as a much needed step back in time to the roots of country music and without a doubt when playing live the crowd will be listening to every word. Mr Jukebox will be available across all platforms from 20th April.